"A data-driven workplace assessment that enables people to identify and discard long-held negative assumptions about job and career success. "We have been using Birkman in The Firm (PKF Texas, P.C.) for over twelve years. Every new hire from the position of manager and above is required to complete a Birkman profile. The benefits the firm has received in the terms of coaching, mentoring, and team building, from using Birkman have been tremendous." that has and still is supporting us with tools to empower and develop our leaders. We use it a lot to understand personal as well as team dynamics from usual behaviors, motivators and preventive/prescriptive work around stress. It also provides specific and valuable tools to enhance dialogue and guide coaching initiatives. The Birkman Methodology is one of the most important and valuable instruments that we use." "We use emotional intelligence as the basis for most of our work, and Birkman ties in very well with emotional intelligence. I believe I am more emotionally intelligent now than I was before – personally – as I've also been able to use it outside of work, within families, friends, and just having discussions about needs and strengths and nonproductive behaviors... just the awareness and the understanding. Even if someone has not taken the Birkman, having that conversation with them will increase and improve the dynamics between you and the people you interface with." "We’ve found the Birkman Method to be an invaluable tool to help teams resolve internal conflicts, and to allow individuals to identify their own communication style and work through how they work best with others." "Because of Birkman’s impact, the longevity of employees averages at 15 years even for field employees who tend to have higher turnover industry-wide." "Three years ago, as the director in charge of consulting, I started using the Birkman program with my clients in an effort to improve the implementation likelihood of the recommendations we were making to our clients. Without a team building and team engineering component to our efforts; some recommendations were not being completed because of our lack of focus on the "human" element. Birkman has been instrumental in improving the implementation process as well as improving the client relationship and experience." Southwest Electronic Energy CEO, Len Benckenstein realized that high turnover rates were affecting his company culture. He began integrating Birkman into the hiring process and after retention skyrocketed, Birkman is now utilized far beyond the initial talent selection process being used to strengthen interpersonal dynamics and organizational performance throughout every stage of the employee lifecycle. The Goizueta Business School incorporates The Birkman Method® into its MBA programs to assist students in enhancing their leadership effectiveness. 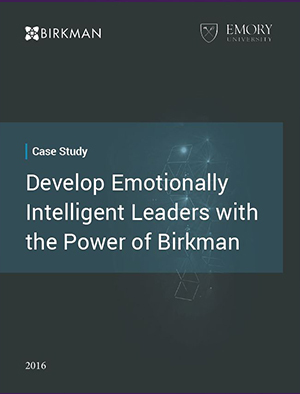 Based upon the Emotional Intelligence framework, the Birkman augments the development of key traits of effective leaders that cannot be solely taught in the classroom.